Ethereal harmonies floating amidst cinematic soundscapes, Fox Glove exists somewhere in the realm of inky alt-folk with hints of dream rock. Based in Victoria, BC, this group is known for their diverse voices and range in sound, and offer everything from sensuous melancholic ballads to spellbindingly strident anthems. A crowd favourite in the BC music scene, Fox Glove annually headlines the famed Alix Goolden Hall in Victoria, selling out the 800 seat theatre with their self-produced LOVE IN – an immersive assembly of music, art, community, and collaboration. With performances across the country, multiple festival appearances, and the release of their first full-length album, Jessie, 2019 is proving to be a catalyst year for this captivating group. Often drawing comparisons to Joseph and The Staves, Fox Glove delivers passion, potency, and a mesmeric live performance that will leave you forever changed. 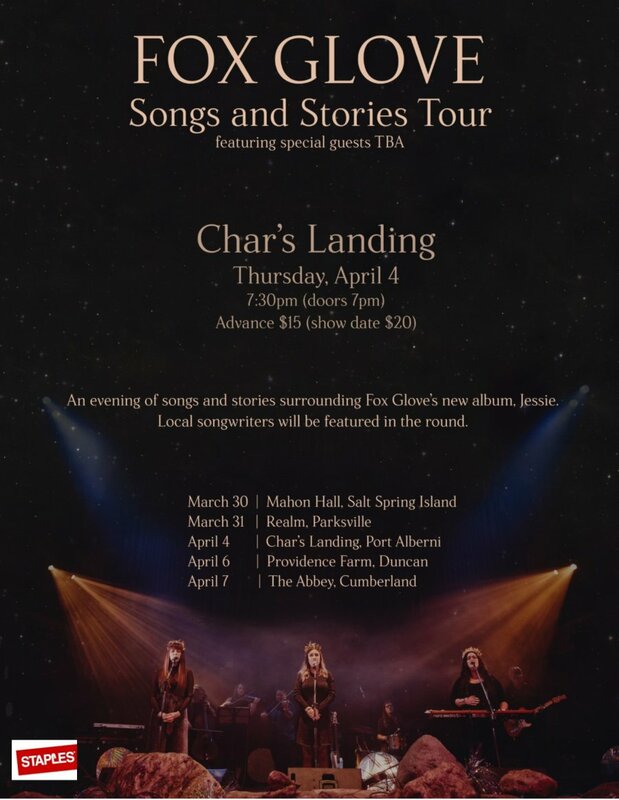 Special Local Songwriter Guests will be featured in the round TBA.